In case of corrosive oils (see issues C1, C2, C3, C4) Sea Marconi implements Chedcos® selective depolarization against corrosive sulphur. Our solution is effective, economic and lasts because it eliminates the cause of the problem, by removing from the oil both DBDS and other corrosive sulphur compounds (DBDS < 10 mg/Kg).At the same time,depolarization by Sea Marconi restores the oil’s functional properties in accordance with IEC 60422 Ed.4-2012, CIGRE 378-2009 Art. 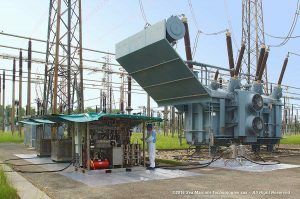 4.2.
appropriate safety procedures also for the “On-Load” mode, mean that the transformer can be kept in service and filled for the duration of the treatment. Sea Marconi’s extraordinary results are based upon its experience in the industry since 1968, the use of Decontamination Modular Units (DMU), designed and manufactured internally, and the formulation of specific reactants (S/CHED®, etc.) used depending on the operating scenario. The DMUs are connected to the transformer via flexible hoses, after which the decontamination process is started: the insulating fluid circulates through the DMUs where it is:heated, degassed, dehumidified, and filtered and depolarised (through special patented reactants) to then returned to the transformer, which is never emptied, not even partially. The continuous circulation of the insulating liquid creates a constant flow of fluid in the transformer that favors the elimination of deposits (sludge) on papers and in the case. a software control system able to check in real time that the process is taking place safely as well as guaranteeing quality, 24 hours a day even without the supervision of an operator. 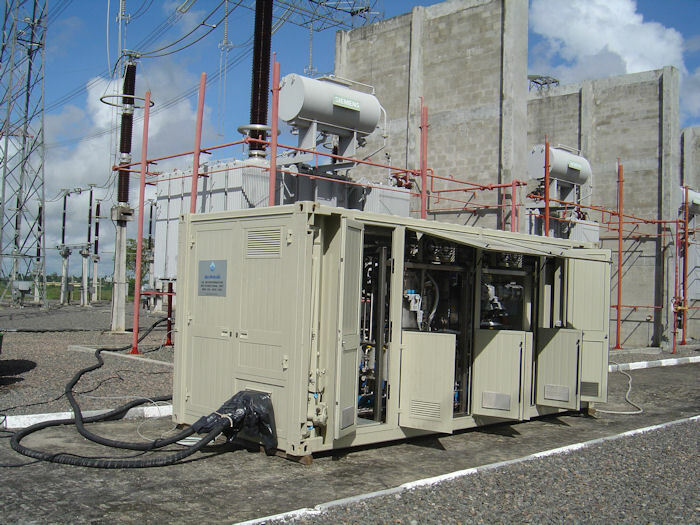 The treatment is performed with the On-Load option, keeping the transformer in service, under tension and filled, i.e. without any loss of production (with international experience also in nuclear power stations and transformers up to 760 MVA and 500 KV). The Chedcos® treatment makes it possible to avoid the logistical and operational issues of an oil change. The new oil would still be contaminated by DBDS (or other corrosive sulphur compounds) present in the “old” oil that would remain in the papers and which would be released shortly after the oil change. Not only changing the oil involves turning off the transformer but also functional risks (eg. : electrical discharges) for air bubbles and atmospheric moisture.